A few days to go for Diwali (festival of lights) and the automakers are offering a range of exciting offers and discount schemes with the onset of the festive season. And the reason behind is the buying nature of Indian audience and offered benefits, discount schemes by the automakers that make them purchase products during this auspicious occasion. This year, the festive season is around a month long, still, the most lucrative offers in the row will be provided near Diwali. A necessary thing that buyers have to keep in mind that offers and schemes may vary from city to city or dealerships to dealerships. So to confirm deals rushed to the nearest dealership. 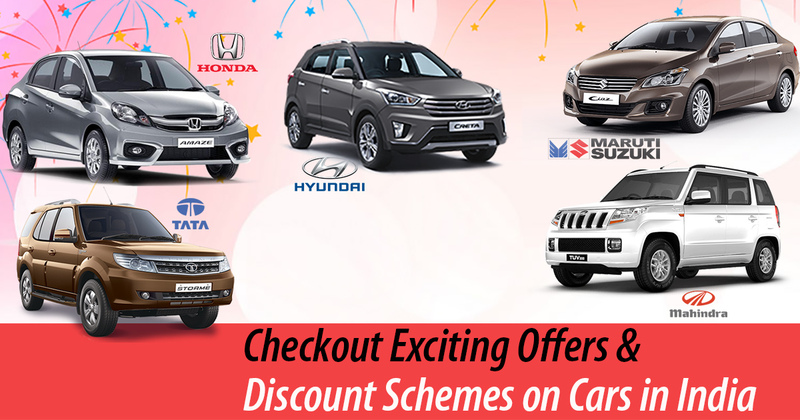 Ranked first in the most selling carmakers in India, Maruti Suzuki India Ltd has brought a range of alluring discount offers on its products ranging from Alto to the Ertiga and even the Ciaz. In the provided offers from Maruti, you will be availed with direct cash benefit, exchange bonus and accessories on select models. The entry-level Alto 800 and the Alto K10 models in a lineup are available with the cash discount of Rs 20,000 and Rs 10, 000 respectively and the exchange bonus on both the models are similar, of Rs 20,000. While the AMT trim of the same is on sale with an exchange bonus of up to Rs 20,000 along with cash discounts going up to Rs 15,000. The offered cash discounts on the Celerio and the Swift is in the vicinity of Rs 20,000 – 22,000 along with Rs 15,000 exchange bonus. The Ertiga that is available for sale in all the three petrol, diesel and CNG variants, is allowing the cash discount of Rs 9,000 on the CNG and Rs 12,000 on the diesel trim. While the detailing for exchange bonuses of mentioned models are Rs 20,000 for the petrol and Rs 45,000 for the diesel. The diesel variant of the executive sedan Ciaz is available with the discount benefit of Rs 40,000 and exchange bonus of Rs 50,000. Mahindra and Mahindra that is renowned for its tough and muscular range of SUVs in the Indian market is also offering a host of offers and schemes this time. The Mahindra XUV500 is available with a cash discount of Rs 41,000 along with an exchange bonus of Rs 15,000 and a corporate discount of Rs 10,000. The three models including the KUV100 5-seater, 6-seater, and the TUV300 are on sale this year with a common corporate discount of Rs 5,000. While, the cash discount and exchange benefits for these mentioned models are Rs 45,000, Rs 31,000, Rs 20,000 and Rs 25,000, Rs 25,000 and Rs 20,000 respectively. The other models which are also on sale with these attractive offers and deals are Mahindra TUV300 with Rs 20K cash discount + Rs 20K exchange bonus + Rs 5,000 corporate discount. On the other hand, the Scorpio is granting Rs 36,000 cash discount+15,000 exchange + Rs 5,500 corporate discount. Hurry up and grabs these model to get financial advantages. In this run, Tata Motors has also joined others with good discounts but on old and existing models not on the lately introduced and premium offerings such as Tiago, Tigor, Hexa and the all-new Nexon. The Nano is being offered with the cash benefits of up to Rs 15,000 and exchange bonus of Rs 10,000. While the other models such as the Bolt and the Zest are on sale with exchange bonus of Rs 15,000 and discount of Rs 25,000 and Rs 20,000 respectively. The SUV offering Safari Storme will be availed with benefits up to Rs 20,000 and exchange bonus of Rs 15,000. The Japanese auto major Honda is offering many discounts and other offerings along with free first-year insurance with it’s lately started, The Great Honda Fest. The Honda Brio hatch in the lineup is on offer with cash discount up to Rs 21,200 while the crossover BR-V receives the cash discount up to Rs 1 lakh. The Honda Jazz is on sale with special benefits of Rs 42,000 comprising a free insurance and a cash discount of up to Rs 15,000. The offer on Honda Amaze is up to Rs 50,000 including 1st Year Insurance and accessories of worth Rs 26,000. India’s second-largest-selling carmaker, Hyundai Motor India Ltd, is also up with some special offers on its range of cars. Though, the products such as all-new Hyundai Verna and Creta that are in high demand are not the part of this year offer. While the products that are witnessing low sales figures such as the Tucson and the Eon are on sale with huge cash bonuses of Rs 70,000 (exchange bonus) and Rs 15,000 exchange bonus+Rs 50,000 cash discount respectively. An additional benefit of Rs 5,000 is also on offer for the government employees. The other models in Hyundai’s India lineup such as Hyundai Grand i10 (except Era) is available with Rs 50,000 Cash Discount + 25,000 Exchange Bonus and Hyundai Elite I20, I20 Active comes with Rs 25,000 Exchange Bonus.